Activists in Utah crafted this sign with bitumen found in pools on the ground at an abandoned tar sands mine. Photo courtesy Before It Starts, via Flickr. Thanks for Waging Nonviolence (http://wagingnonviolence.org/2012/09/opposition-mounts-as-first-tar-sands-mine-in-us-gets-a-green-light/) for this article. Last week, a new front opened in the struggle against tar sands mining in the U.S. If you didn’t know that tar sands mining is in the works on this side of the border in the first place, you’re not alone. Most people don’t realize that tar sands extraction, which has caused tremendous pollution and environmental degradation in Canada, has crossed the border to U.S. soil, where it has taken root in Utah. Activists on both sides of the border have been working fervently to halt the spread of tar sands in Canada and the piping of tar sands oil from Alberta to Texas. Beginning with Tar Sands Action’s mass arrests outside the White House in August 2011, followed by the Indigenous Environmental Network’s protests at the climate talks in Durban that December, activists have made Canadian tar sands mining and the Keystone XL pipeline to the Gulf of Mexico a high-profile issue this past year. Now, direct action campaigns like the Tar Sands Blockade in Texas are continuing the effort to stop construction of the southern leg of the pipeline by disrupting business as usual for the oil industry. 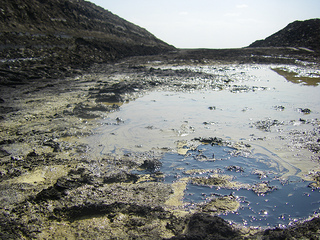 The threat of tar sands mining in the U.S., however, complicates the struggle. It forces geographically divergent groups to either divide their efforts or find ways to unite across vast distances. That’s why groups like Utah Tar Sands Resistance and Before It Starts are forming a strategy that can join, as well as compliment, the tornado of opposition that has formed against the tar sands industry. Before It Starts — co-founded by Ashley Anderson, who began Peaceful Uprising with Tim DeChrisopher in 2009 — is focusing primarily on national outreach, while Utah Tar Sands Resistance is focusing on forging local and regional coalitions. In both groups, activists who have experience in nonviolent direct action are prepared to ramp up efforts when the time is right. Thus far, however, the struggle has mainly been waged in the courtroom. This two-acre mine is just the beginning of U.S. Oil Sands’ plans for the region. Photo courtesy Before It Starts, via Flickr. 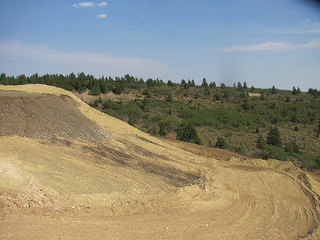 The environmental group Living Rivers initiated a legal challenge in 2010 to halt the progress of what’s set to become the first commercial tar sands mine in the U.S. — a forested area in Eastern Utah called PR Spring, which the state has leased a portion of to the Canadian mining company U.S. Oil Sands. Living Rivers has contested the company’s permit to dump wastewater at the mine, but last week, the judge — an employee of the Utah Department of Environmental Quality — sided with U.S. Oil Sands, granting it the right to pour toxic wastewater into the remote wilderness of eastern Utah. The case hinged on whether or not PR Spring contains groundwater. In the hearing back in May, U.S. Oil Sands argued that the land holds no groundwater, which means that polluting the land wouldn’t contaminate water systems. But according to engineering geologist Elliott Lips, who spoke as a witness for Living Rivers, the land holds numerous seeps and springs, which the toxic tailings would pollute before either continuing to flow into rivers or percolating downward into the Mesa Verde aquifer. Ultimately, the judge was satisfied knowing that the company had conducted its own tests and would have reported water if it had found any. To catalyze mass resistance, the group plans to lead trips to the site. “Helping people experience the majesty of this land firsthand will show people how much is at stake, and move them to take a stronger stand,” said Utah Tar Sands Resistance co-founder Lionel Trepanier. Together with activists from Peaceful Uprising and Living Rivers, Utah Tar Sands Resistance visited the PR Spring site two weeks ago, and members returned home ready to ramp up efforts to halt the mining. As a member of both groups, I went along on the trip, because I wanted to see firsthand what the land looked like and whether the mining company’s claims about the absence of groundwater were accurate. As it turns out, they couldn’t be more false. Water has etched its presence into this land, leaving creek beds that may run low at times but never go away. And clearly, the area holds plenty of water to support the large herds of deer and elk, as well as the aspen, Douglas firs and pinyon pines that make up the dense forest covering much of the land. The surrounding forest is threatened by U.S. Oil Sands expansion. Photo courtesy Before It Starts, via Flickr. This vibrant green scenery was juxtaposed by the two-acre strip mine just feet away from the forest’s edge. The difference between life and death could not have been more stark. Looking into the face of such destruction, I realized it’s no longer about saving the ecosystem, or saving our water — it’s about saving life on Earth. But that kind of effort isn’t possible without a broad movement behind it. While still in the first leg of its campaign to stop tar sands and oil shale mining, the group is reaching out with its teach-in and slideshow presentation to a wide range of outdoors retailers, religious communities and groups concerned about environmental quality in the city. When they handed out flyers and spoke with attendees at a recent Nature Conservancy film screening, they were surprised at how many people in the seemingly politically moderate, middle-class crowd were outraged at the prospect of tar sands mining coming to Utah. 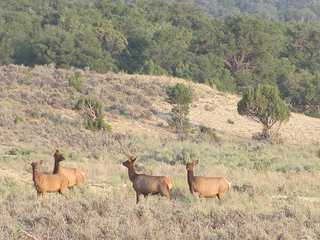 An elk herd grazes along the ridgeline near the U.S. Oil Sands mine. Photo courtesy Before It Starts, via Flickr. After the Utah Tar Sands Resistance secures a vehicle to use for the trips, they’ll invite people at the teach-ins to attend, and will bring as many as possible to the site. They feel that being in nature together will break down barriers, helping them to see each other not as the labels society assigns them, but as human beings who are mutually dependent on the ecosystem, and on each other. To raise awareness and empower people to join a coalition that ultimately aims to halt the destruction of tar sands and equally-destructive oil shale mining, Utah Tar Sands Resistance and Peaceful Uprising have been working together on creative methods of outreach. In April, they staged a flash mob dubbed Citizens’ Public Hearing in the office of the state agency leasing out public land for tar sands mining. Dozens of people flooded the office, where a woman playing an elementary school student announced that she had called a public hearing to expose the agency’s misguided decision to let state lands be destroyed. They also performed a similar street play, called Bringing Science Lessons to the Governor, outside the governor’s mansion when he held a luncheon to talk energy policy with four other Western governors. Members are now building a “tar sands monster,” a Frankenstein-inspired creature who never wanted to be pulled from the earth to pollute the waters, which they believe will make an attention-getting mascot for their efforts. The activists also plan to use online videos of their theatrical endeavors as an outreach tool to get activists across the country thinking about joining them in their struggle when the time is right. Uniting a diverse range of people such as activists, farmers, landowners and outdoor enthusiasts, many of whom may have not previously thought of themselves as activists, will be important, as this is only the beginning of proposed tar sands operations in the U.S. The state agency (School and Institutional Trust Lands Administration, or SITLA) that leased the PR Spring site to U.S. Oil Sands holds pockets of land scattered around the state, which it may lease for tar sands and oil shale mining. The Bureau of Land Management is also considering leasing nearly 2.5 million acres of public land throughout Utah, Wyoming and Colorado for tar sands and oil shale mining. Much of this would overlap with indigenous land or is in close proximity to national parks and other protected areas. In the meantime, Living Rivers will likely appeal the decision to let U.S. Oil Sands dump wastewater into the land. Its success, however, will be determined by the extent to which groups like Utah Tar Sands Resistance can educate and empower the general public. Such a base of support, like the one that has formed in Texas, will not only pose a challenge to fossil fuel interests, but also help to usher in a new era of environmental justice. This entry was posted in Lobbying, Mining & Drilling, Movement Building & Support and tagged Courts, Oil shale, Tar sands, U.S. Oil Sands, Utah, Water on September 11, 2012 by DGR Colorado Plateau.